Fairway Vista At Las Colinas is a residential gated community located 10 minutes away from DFW Airport right off Highway 114 in the central portion of Irving in the 75038 zip code. The community has easy access to Highway 183 and Highway 114. 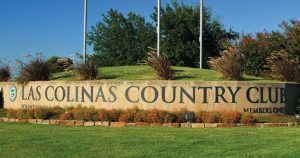 This neighborhood has condos, townhomes and single family homes and is located right across the street from the Las Colinas Country Club. Homes in this community range from 600k to 1.3 million and were built between 1998 and 2005. Fairway Vista At Las Colinas is less than two miles from the Irving Convention Center and the DART Rail. Residents of this community will enjoy having just a short drive to get to any of the local hotspots in Las Colinas, shopping, restaurants, Richland Community College, American Airlines Center (AAC), DFW Airport and Downtown Dallas. You can find more information about the schools, neighborhood and country club with the links below.